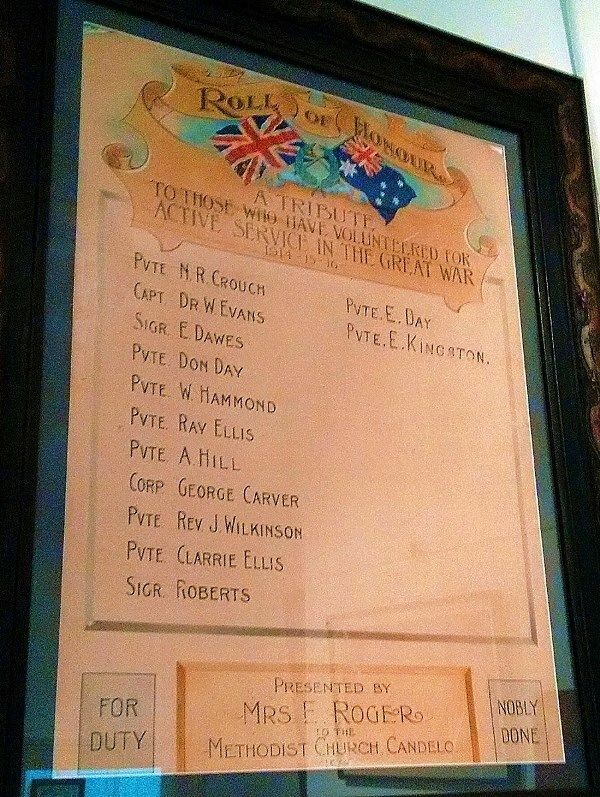 An artistic printed honour roll commemorates those from the church circuit who volunteered for active service during World War One. The local Methodist Church was filled at last Sunday night's service, when a Roll of Honor was unveiled as a tribute to the men who have enlisted from the Methodist churches of the circuit, with the addition of others in whom the local Church had special interest. The names of the men are: Dr. W. Evans, Rev. J. Wilkinson, Corporal S. Carver (Pambula), Ptes. I R. Ellis, C. Ellis, W. Hammond, E. Dawes, D. Day, C. Roberts, Hill (Wolumla), Edgar J. Kingston (nee Holzhauser). It was a matter for regret that the memorial on view did not represent the wishes of the generous donor, Mrs. Rogers, nor the plans of the Church officers. Those to whom the work was entrusted failed to accomplish what was intended, and instead of a substantial memorial worthy of a permanent place in the church as a tribute to the men whose names it wouid perpetuate, a flimsy bit of lithographic work in a frame was opened up, to the keen disappointment of everybody. We under stand that this is to be immediately replaced by a memorial in keeping with the original intention. The unveiling ceremony, however, was formally carried out by Mrs. Rogers, who said it was a sad but proud privilege. When she drove the first nail in the Candelo Methodist Church years ago she did not dream that it would ever be her duty to perform such a function as this. She paid tribute to the men who had gone to represent the Church in the great struggle for freedom and righteousness. Southern Record and Advertiser (Candelo, NSW), 30 September 1916.